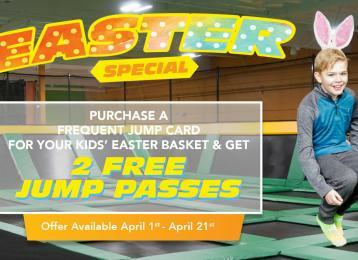 Purchase a 90 Minute Jump Pass and get Upgraded to a 120 Minute Pass for FREE! Don't Miss Out on this limited time offer! Promotion Valid While Supplies Last during Open Jump Time. Available in Park or Save Time and Buy Online from our webstore! Choose 120 Minute Jump and Enter Code JUMPLONGER.